Wishing you good health, personal joy and professional success and satisfaction in the New Year. We would like to take the opportunity to thank all our clients and business partners for visiting our stand at the Mining Vietnam Exhibition 2018 in Hanoi. We look forward to seeing you again in the near future. The complete offer of products and devices for building and maintenance of railroads. New technology and technical means of flood protection PROTEX-K have brought many solutions for all living or enterprising in areas being in danger of floods. The dam construction rate, small demands on construction areas and easy access are the main merits of this technology. With many types of large volume bags (5 versions), filling mixtures prepared from commonly available construction materials (fly ashes, sands, fillers) as a stabile or temporary type and with pumping sets, it is possible to construct the "tailor made" protective levees PROTEX-K with low costs and small manpower required. 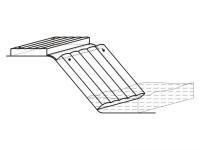 The option regarding the bag types and mixtures is a matter of customer´s choice, terrain profile and purpose of this structure (stabile, temporary). 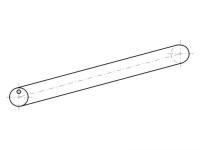 Stabile hose bag, single cylinder of various diameter up to 750 mm, which represents a simple, relative low structure. Kidney bag , the group of two or three hose bags connected through textile enabling to build a levee wit height up to 2 m. This levee type has been designed to protect effective the landscape, residential and industrial areas with the construction of "dry polder" levees etc. 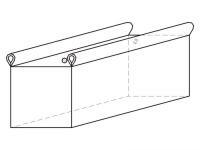 Building-block bag, shaped as the prism of different dimensions designed to be as the quality equivalent for damming up the destroyed levees instead of standard using the back filling with quarry aggregates. City Bag, which is the variant to the building- block bag shaped as well as the prism of different dimensions and which has been designed for construction of flood protection levees especially in city districts as the quality alternative to the sand sacks. 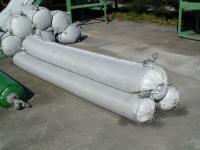 Removal of these bags is simple using common available handling equipment. Mattress bag, which has really mattress shape with ground plan dimensions according the use and which is designed to protect, contingently to seal seeping levees, seeping embankments or for protection of certain areas. In addition to the above types, the "tailor made" large volume bags is possible to have which have many diameter and length dimensions. The bags are designed so that the "sleeve valves" are used for filling them. The venting is through the breathing valves. Lost - after ceasing of the flood danger ad bags removal, the mixtures - "are spread out" and cover the terrain. Stabile (solidifying) mixtures are filled into the bags used for permanent protection of communities, farms, industrial areas, individual buildings, for heightening the existing and construction of new levees, consolidation of river and ponds, for building the retention pond and dry polder dams etc. To the main components of these mixtures belong cement, fly ash, (stone dust, sand etc.) and water. After setting bond strength of these mixtures is up to 15 MPa depending on the materials for the individual mixtures and pertinent recipes. The short time period for construction building and small necessary site area for construction (ca 4 times smaller compared to the soil dams) are the main advantages of this technology. 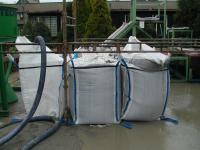 Parking mixtures (non solidifying) are used for filling the bags equipped inside with PVC insertion. Parking time period stated for min. 14 days is the period, after the expire of which it is possible to remove the mixture from the bag using the technical equipment and so to liquidate the flood protection construction. Lost mixtures are used for filling the hose bags, building- block bags and especially City Bag types. Sand, suitable soil (without clay), stone dust etc. and water are the main components of these mixtures. In case of these mixtures the composition is not stated. After ceasing of flood danger and bags removal this mixture is spread in the terrain without negative influencing the surrounding countryside. 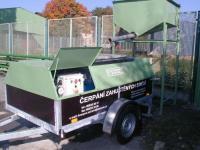 For filling the large volume bags the special screw and piston pumps have been developed with capacity up to 40 m3.h-1. The pumps of the KOEXPRO OSTRAVA, a.s. company are in question and namely type KTX 80 up to 200. 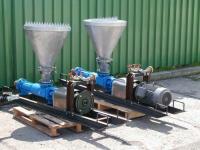 The developed and in operation successfully proved pumps enables the bags to be filled from so- called "dry" workplace. The screw pumps type KTX 80 or KTX 125/1 have been developed and constructed for pumping and piping transport of high density slurries into the rooms (bags) on a shorter distance, e.g. 400 meters. The piston pumps type KTX 150 or KTX 200 with a hydraulic drive have been developed for pumping and piping transport of high density slurries on bigger distances, e.g. up to 1 500 meters. For filling the bags the common mobile building pumps type Schwing, Putzmeister etc. and for transporting the truck mixers are also possible to use. The developed technology and technological processes using the new technical equipment (pumps, bags, mixtures) on common available equipment, especially fire fighting hoses "B" ø 75 mm or "C" ø 52 mm, piping DN 100/PN 40 and others enable to improve the conditions and effectiveness of flood protection measures or to be effectively prepared on the coming of the flood. Based on agreement between KOEXPRO OSTRAVA, a.s. company and Těrlicko Municipal Authorities, the flood protection levee was built in local area Těrlicko - Hradiště (Stonávka river left embankment) on 22.11.2000, and namely using 4 kidney triple bags - hose ø 340 mm, total length 90 m (3 x 25 m, 1 x 15 m) and max. height of 0,8 m. Mixture consisting of fly-ash, cement and water was the filling material. With the levee construction, measures regarding the property protection was fulfilled (inundation of the recreation kemp) and the flood danger class was reduced by the institution Povodí Odry in the year 2003. Based on the agreement between the town Letohrad and KOEXPRO OSTRAVA, a.s. company, the flood protection levee was built in local area Letohrad - Kunčice (Tichá Orlice river) on 1.12.2000, and namely using 3 kidney triple bags - hose ø 340 mm, total length 48 m (2 x 15 m, 1 x 18 m) and max. height of 0,6 m. Mixture consisting of fineness aggregates Mistrovice with cement and water was used. 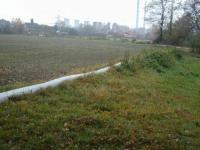 In the year 2001, protection of two parts of the Petrůvka river bank were made. In both cases, mixture consisting of fly ash, cement and water and two kidney triple bags with diameter of 340 mm and length 56 m (1 x 30 m, 1 x 26 m) and max. height of 0,7 m were used in local area Prstná. The bags were covered with soil and the grass seed was sown. In local area Pastvisko a flood protection levee was constructed using the hose bag with ø 300 mm and length 106 m.
Based on agreement between the Běla Community Municipal Authority and KOEXPRO OSTRAVA, a.s. company the flood protection levee was constructed on the local brook left bank using 5 pcs hose bags ø 300 mm having the total length of 327 m and max. height of 0,3 m. The levee was divided into two parts - length L1 = 203 m (2 bags á 70 m, one bag á 63 m), length L2 = 124 m (one bag á 60 m and one bag á 64 m). The filling mixture was composed from fly ash, cement and water. On the place where the brook crosses the road, there is not a levee. the free section between two bags is ca 3 m. In case of flood danger, this section will be protected using the kidney double bag equipped with inner PVC insertion. This is stored in the local firemen crew house and will be filled with water using the pump or hydrant. After ceasing of flood danger the water will be drained, the bag dried and stored in the firemen house for further use. Based on the agreement between the Olešnice town and KOEXPRO OSTRAVA, a.s. company, the flood protective levee was constructed on 12. - 14.11. 2002 using the triple bag of total length 103 m and max. height of 0,9 m located behind the FC Olešnice football sports ground dressing room house on the river Hodonínky left bank. The levee is divided into 4 parts. 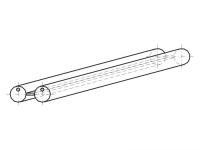 The upper section consists of bags 1 - 3 (bag dimensions: bottom ø 350 mm, upper ø 450 mm), lengths 27.7 m; 27.8 m; 20.3 m. The lower section is from the bag 4 (bag dimensions: bottom ø 450 mm, upper ø 550 mm) with length 27.2 m. For the consolidation of the river upper section bank the mattress (width 4 m, length 2.1 m) was used. The mixture consisting of fly ash, cement and water was the filling material. With construction of this levee the requirements for community property protection were fulfilled in this locality and this structure has been incorporated into the flood protection plan of the Olešnice town. On all sites given in above references, the inspections were made in 08/2008 checking the conditions and efficiency of these flood protection PROTEX-K. The municipal authorities of concerned towns expressed unequivocal satisfaction. Levee stress analysis scheme (constructed using 3 x "triple hose"
possibility to use them as a protective measure against the landslip (through a surcharge of the footing sliding surface etc.) and others. All above merits have to be tested and evaluated "in situ", because they are based predominantly on the computer models.